While there are several actors in Bollywood who want to give back to society in their own ways but superstar Akshay Kumar stands out for his uniqueness. Kumar, who is among the highest earning actors in Hindi film industry, has donated Rs 1.08 crore to the families of CRPF jawans martyred in a Maoist ambush in Chattisgarh. The Rustom actor has time and again showed his altruistic side and stressed that our jawans not only need medals, they require financial support also. Being the son of an army man, Akshay remains very vocal about his love for Indian defense forces. 1. 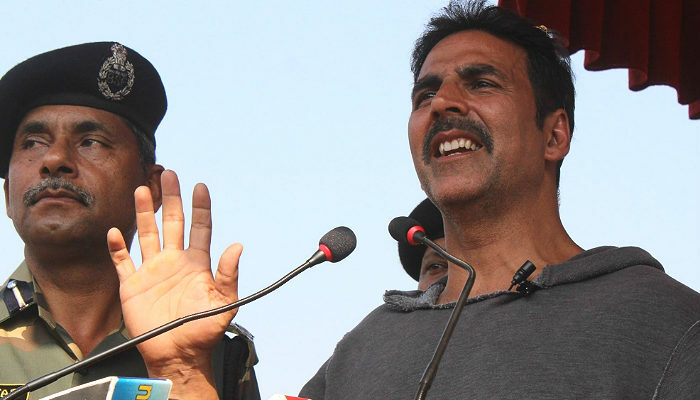 Akshay Kumar rallies for the welfare of our army jawans‘ families. On the eve of Republic day, Kumar proposed an idea of developing a website or a mobile app, which would allow people to directly contribute and donate money in the bank accounts of the martyr’s family. 2. Following the terrorist attack at an army camp in Uri that claimed lives of 19 soldiers, Akshay issued cheques of Rs 5-10 lakh for each of the martyr’s families. “A medal or an award is good but not enough. More needs to be done for them and their families. They need money too,” he said. 3. The actor also reached to the family of Rifleman Prabhu Singh of Rajasthan, whose body was allegedly mutilated by Pakistani troops on Nov 22, 2016, and transferred Rs 9 lakh in their account. The actor also provided financial aid to Jawan NK Narpat Singh Rathore, who was killed in an attack by ULFA militants in Assam in November 2016. He said, “We actors are reel life heroes but people like Narpat Singh Ji are real life heroes. My feelings are with the family and I will stay in touch with your family in future too. Also read: Watch: Do these 3 fan theories answer why Katappa killed Baahubali? 5. Not only soldiers, the actor has also come to the rescue of drought-hit farmers in Maharashtra in 2015 when he decided to donate Rs 15 lakh a month, for six consecutive months to a village in parched Beed district of Maharashtra. 6. Kumar has also given voice to concerns over women safety in India. Recently, he spoke out against Bengaluru mass molestation case. Earlier in 2014, he had launched the ‘Women’s Self Defence Centre’ in Mumbai, a martial arts and self-defense training school for women, completely free of charge. 7. Kumar has also lent his voice against the poor compensation paid to stuntmen in the Indian film industry. The Holiday actor reportedly made a pact with producers he works with, to pay the stuntmen the same amount he is paid to do particular stunts. Later, he also led an initiative to secure insurance for the stuntmen in the film industry. 8. Akshay Kumar’s charitable works also involve animal welfare. The actor donated Rs 3.60 lakh for an animal welfare organisation ‘Youth Organisation in Defence of Animals (YODA)’ during the release of his film Entertainment (2015). 9. Akshay crooned a Punjabi bhajan titled ‘Nirgun Raakh Liya’, shot a music video, and donated the revenue to the victims of July 11, 2006, train bombings in Mumbai. 10. Last year, Akshay also donated Rs 1 crore for the relief work for the rain hit Chennai. The actor donated a substantial amount to the Bhoomika Trust.